Hobgoblin Music are the UK’s leading specialists in folk and acoustic instrument retail. Their Brighton branch is kindly providing a Hohner harmonica trade stand at Harpin’ By The Sea. There will be deals on instruments and payment can be made by cash or card. This is an excellent help point for first-timers, anyone who forgets their harmonica(s), anyone wanting new keys, and anyone who just fancies expanding their collection. Hobgoblin Brighton. 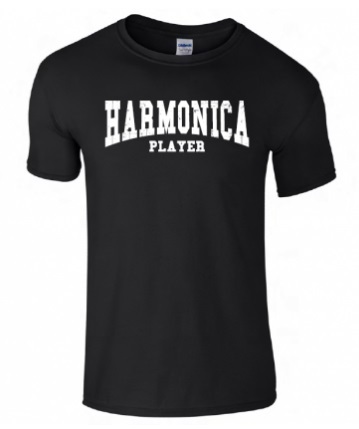 In addition to his excellent tutorials at Harpin’ By The Sea, Paul Gillings will also be providing a trade stand for his harmonica-tees designer t-shirts. Check out Paul’s exciting range of shirts, or order your souvenir event t-shirt direct with the man. If you’re low on funds, or undecided on the day, you can of course visit our t-shirt page after the event to order your souvenir shirt.